The European Central Bank's Guide To Influence : Planet Money As heavily indebted European countries have seen their options dwindle, the ECB has flexed its muscle — and not always subtly. Europe is struggling, thanks to a relentless debt crisis. Compounding its problems: It is not one country, but 17. Many observers agree that to solve their problems, those countries have to start looking a lot more like one country. And there is a force in Europe trying to make that happen: the European Central Bank. The weapon it has that everyone else lacks? Money. Princeton Economist Alan Blinder used to work at a central bank, the U.S. Federal Reserve. And central banks don't like to use brute force, he says. "The central bank is normally contemplative, slow-moving, intellectual, and very polite," Blinder says. Central banks do have one magic power. They can create money, which is something a lot of countries in Europe really want. The European Central Bank is the only place that can make more Euros. And so it's using this power to extract concessions from the countries of Europe, says Jacob Kirkegaard, a research fellow with the Peterson Institute for International Economics. "Throughout this crisis," Kirkegaard says, "the ECB has provided financial support only when the governments have committed to hand over more of their national sovereignty." Did you get that? The ECB only gives you money if you give up some of your independence. The ECB says to the Greeks, for example, "You can't collect taxes the way you're doing it, it's ridiculous. You've got to get better." To the Spanish: "Your government can't spend so much money. Cut back." Thanks to its unusual powers, the ECB has succeeded in forcing European governments to do things they otherwise might not have. First example — August 2011: The Italian government couldn't find anyone to lend it money. It went begging to the ECB. 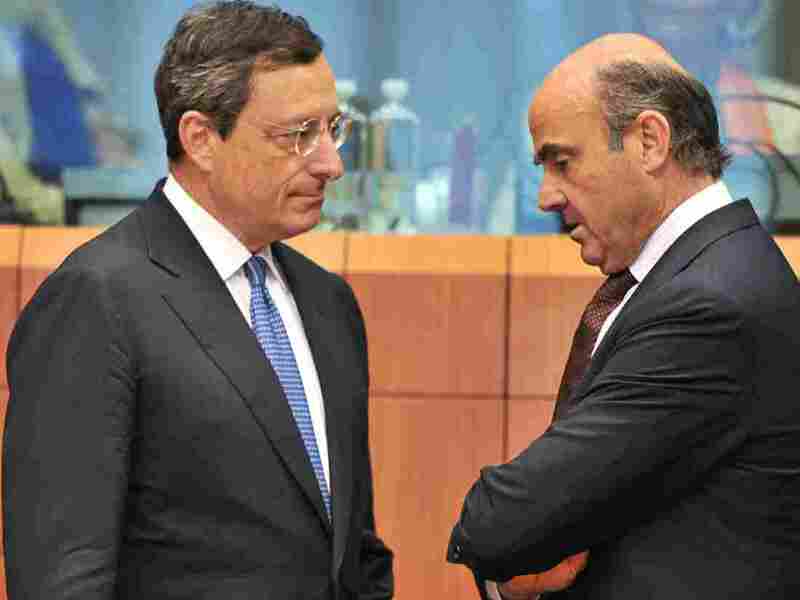 The president of the ECB sent a secret letter to Italy, to prime minister Silvio Berlusconi. It was leaked online a few weeks later. It gave Berlusconi a long list of reforms he would have to carry out in return for the bank's support. Italy eventually adopted the reforms. The ECB helped Italy out. As part of the process, Berlusconi was forced to resign and economist Mario Monti took over. Blinder says it was a pretty bold move for a central bank — particularly this one. "I was mainly surprised at how frank they were about it," Blinder says. "Central banks are not known for their frankness, and Europeans are low on the frankness scale." Second example — last December: Various southern European countries are scrambling to borrow money. The European governments make a fiscal pact, promising to cut spending — and, crucially, to send each of their national budgets to a team in Brussels for approval. And then, without much fanfare, the ECB comes through with the money. And the debt crisis quieted down. For a bit. Recently, though, it's heated up again. Also, in the last few weeks, the ECB has launched a new campaign. Lately, every time a governor from the ECB appears in public, they talk about the need for a banking union. And what's happening now in Europe? No longer will Greeks run Greek banks, and Italians run Italian banks however they want. Now there will be one regulator in charge of all the banks across the continent. Now, it could prove dangerous to force countries to the brink in exchange for money they need. On the other hand, a lot of the changes they're making are changes they've needed to make for a long time, many observers say. The European Central Bank didn't want to comment for this story. They don't really like discussing their plans; their actions speak for them. But with this new centralized banking union, the ECB seems, once again, to have pushed these very different countries closer together.